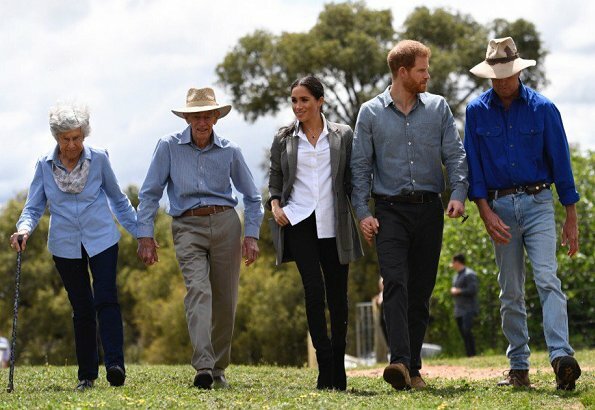 On the second day of their Australia tour, the Duke and Duchess are visiting Dubbo. 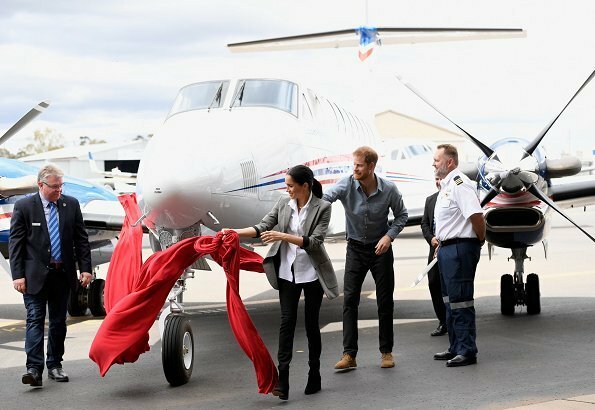 On October 17, The Duke and Duchess of Sussex arrived at Dubbo Airport. 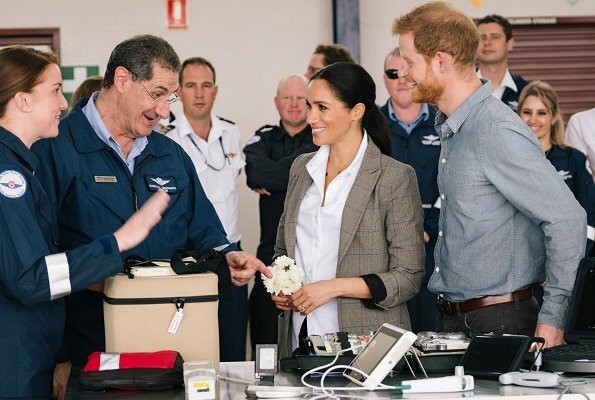 The Duke and Duchess visited the Royal Flying Doctor Service in order to learn more about the life-saving role the aviation service provides for people living in rural and regional areas. 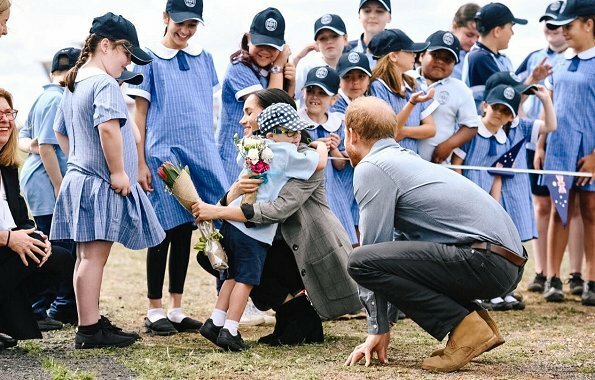 In the afternoon, The Duke and Duchess visited a local school which aims to improve the education outcomes of young Aboriginal and Torres Strait Islanders. Students opened up their classrooms to present their work and participated in a session of netball and touch football drills on the school oval. (During Dubbo visit, the Duchess wore a Boss Oversized Blazer by Serena Williams Collection, an Oxford classic shirt by Maison Kitsune and an Isabel Jeans by Outland). The time coming I'm sure they will be excellent parents. Funny pic with the umbrella. Just love seeing these two! And they both look great, too. Meghan seems to be a lovely person. However, her fashion style is not in my taste. So far away from Kate's well-fitting and sophisticated clothes. 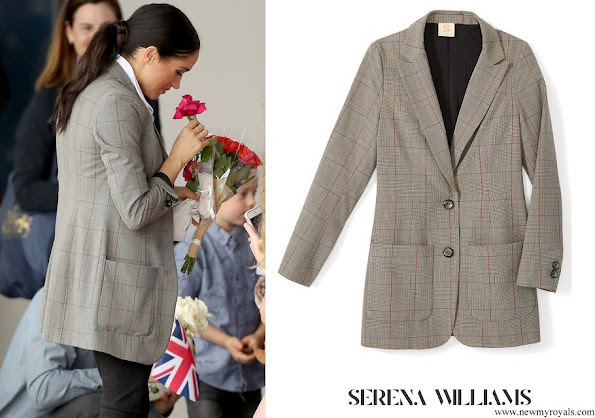 Maybe Meghan is more interested in her job and duties than in picking "sophisticated" clothes. Her style is so modern and chic. This casual outfit is very good. I don't think Kate wears such sofisticated clothes. Most of them make her look like older. In the fashion business I think Meghan is a breathe of fresh air. Yes, indeed and so is Prince Harry! This is one of my favorite Meghan outfits so far! The umbrella pic is so adorable! Please do some research. She is not dressed like a celebrity. In Nederland heet dat laagdrempelig. This is a perfect hair style . I think this outfit is absolutely appropriately sophisticated for a visit to a sheep farm and kindergarte. Agreed. I think she looks lovely and well attired for the multiple outside events they're attending. Well said and I like their affectionally interacting with one another. 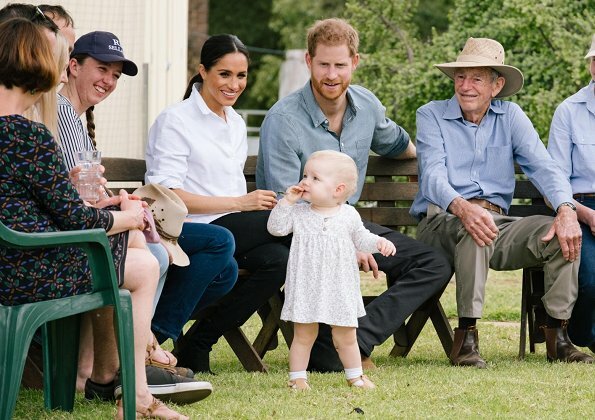 For me this is a complete disappointment, she had such a wonderful sense of style when she was a celebrity, and this is plain boring, she doesn’t look like a royal at all, she’s not wearing any Australian designer and is very blah to me. I know we shouldn’t compare her style with Kate, but the impression Kate he is miles miles away from this. Her jeans are by an Australian company. 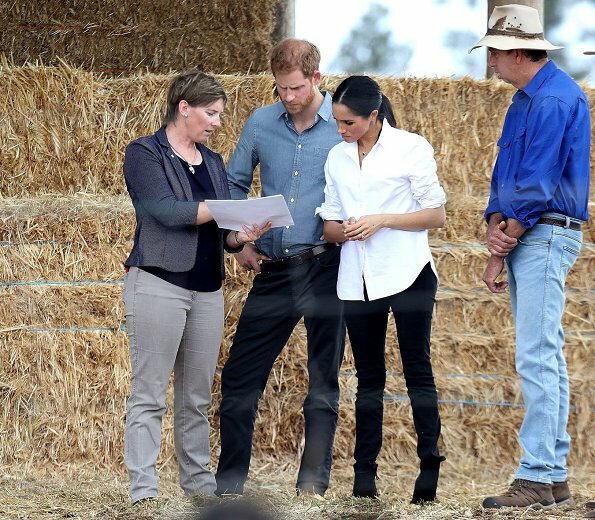 What do you expect her to wear during a visit to a farm? Also, i believe her necklace & earrings are by an Australian designer. Well tsk tsk that she did not wear a dress and heels and tons of jewels to visit a farm. Dump feed. See animals. Hang out in a airport and basically sit and kneel in the grass all day. What should she wear? She is damned if she does and damned if she doesn't. 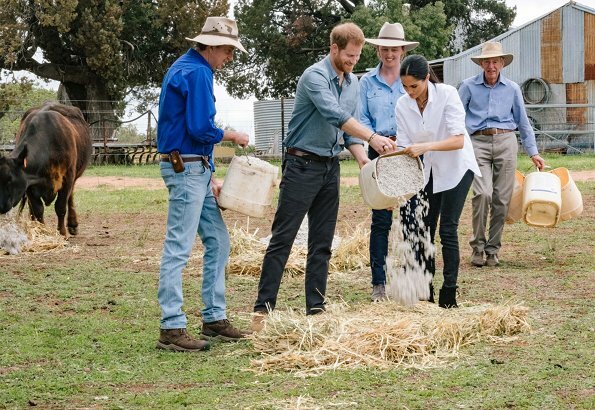 If she had showed up dressed like a 'royal I suspect some would be still negative about her lack of sensitivity visiting a rural area that is economically depressed due to the drought. She was dressed appropriately. Plus she BAKED banana bread for the lunch ...outside ... at Admiralty House. She is really quite something. Give her a break...please. She has been wearing Australian designers. And the more new clothes she wears, the more people will complain that she has spent too much money on clothes, especially when she is pregnant and she can't wear them again. This poor girl will be condemned no matter what she does. She looks lovely. 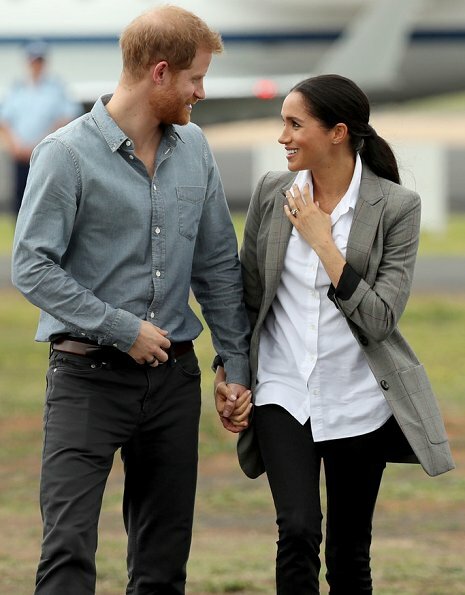 Actually their happiness shows so much it is just a trivia what Meghan is wearing. Love the story how she made a Banana Bread to take with her. Pony tail suits her, just like Crown Princess Victoria. It s neat. 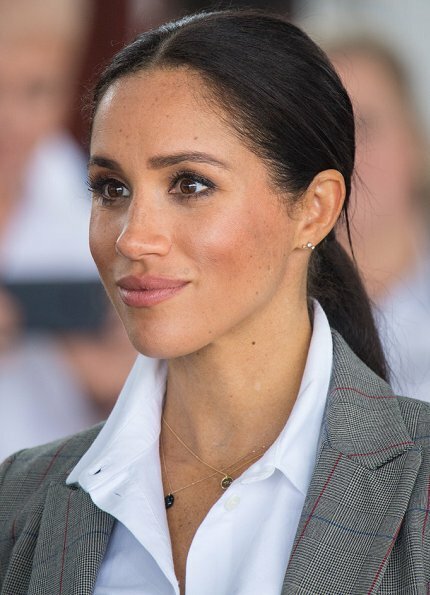 Nice blouse and blazer.Meghan is glowing. Pregnancy looks good on her. The hugs from the little boy are priceless. I think she looks wonderful. The ponytail looks so cute on her and the picture of her holding the umbrella is adorable. I love her outfit, perfect for the occasion. She is Meghan and not Kate, why must we compare? She is American born and Kate is British, there is a difference in styles and I think it is great to see some changes and not the same type of outfits on both ladies. They are not the Stepford wives...!!!! I also like Catherines style better, much better. But I see no sense in comparing them. Each woman has her own style. And: each of them has her own role, I think it is a great difference wether you are crown-princess - or not! Well Meghan has no style at all. Boring clothes all the time. This is the perfect outfit for a visit to the Australian outback. These are country people who have been suffering drought, many of these children come from disadvantaged backgrounds. Look at what their hosts are wearing - Harry and Meghan wish to blend in. Another beautiful outfit of the Duchess of Sussex. She is doing very well!!! 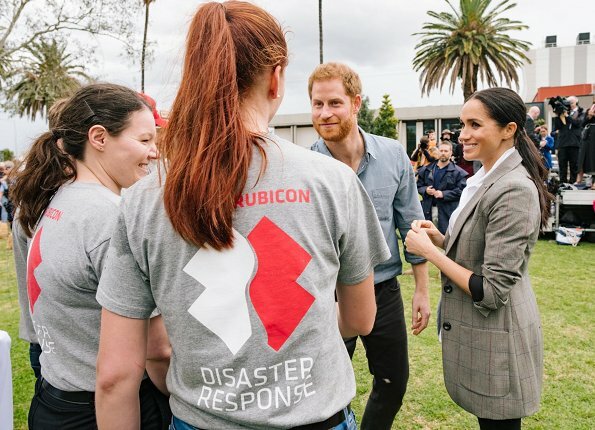 I respect the Duchess of Sussex as well for her work ethics, which you can recognize if you are really interested in people or able to have empathy. I think this outfit was spot on for the events today ( and believe that Kate would have worn something similar for those who want comparisons) It was great to see Meghan with a tidy ponytail for once, no straggles. What a difference that small change makes. 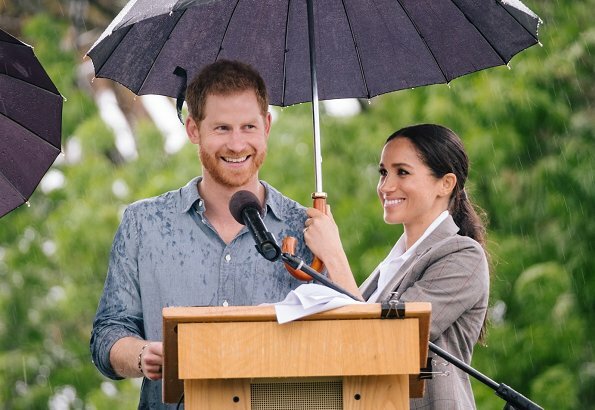 She looked great and the photo of her holding the umbrella over Harry is fantastic. I love it. Overall her outfit looks good. Two things for me though. The jacket looks too long on her and the boots look wrong with this outfit. They make her legs look even thinner and it reminds me of a child in their mothers shoes. I just feel a different pair would have made the outfit a bit better. Love her hair pulled back. She should do that more often. Thank you, thank you! I can't believe my eyes when I read those nasty, jealouse comments about her and her style. She is a modern woman and always relaxed and natural. OK, I understand that we are from different countries and cultures (I have said it before) but I can't understand hatefull and narrow-maintid comments. Unbelievable - I cannot believe, what I read - so much ugliness and nastiness! Why you didn’t read, where they were. Should she wear evening dress in the farm between cows??????????? She was perfect dressed as always.